Q. I can search detail records with abstracts in say the Journal of Social Psychology, but how do I get the to article itself? Clicking the PDF Full-Text link will result in downloading the document as a PDF. If you do not see a PDF Full Text link, that article may not be available online yet. If the article is not available online yet, you can get access to it by clicking on the detailed record, and on the left side of the screen is a small "Find it" button. 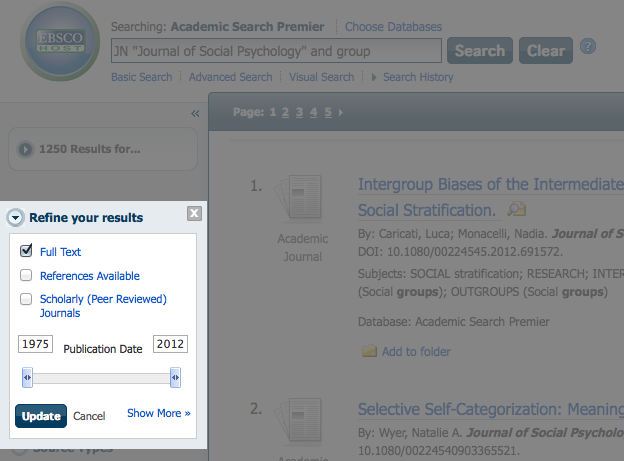 When you click that, you can click a link that will allow you to request a copy of the article from another library. This is a free service for all Trine students, faculty, and staff, and it usually takes 2-3 days to get a copy of the article that will be emailed to you. If you only want to look through articles that are available full-text online, when you do a search there is a box on the left-side of the page that will allow you to limit only to full-text results. Trine LINK is happy to assist in locating articles on any research topic - please let us know how we can help!